Pity the poor Scottish voter. On May 28, both the independence-supporting Scottish government and the stoutly opposed UK Treasury published economic forecasts claiming their favoured outcome would leave the average Scot at least 1,000 pounds better off annually. The pro-secession numbers look weaker. It’s not surprising that the results are different: the starting assumptions vary greatly. Edinburgh reckons independent Scotland’s fiscal deficit, including debt service charges, will be 2.8 percent of GDP in 2016/17 – the first year after Scottish independence. The Treasury reckons 5.5 percent. Credible independent forecasters such as the Institute for Fiscal Studies are closer to London’s numbers, and the No-voters also make the reasonable assumption that Scots’ borrowing costs are 1.2 percentage points higher rather than unchanged. Then there’s oil. Edinburgh assumes 6 billion pounds in oil and gas tax revenue in 2018/19, using industry estimates. The Treasury sticks with the Office for Budget Responsibility prediction of 3.5 billion pounds. Again, the latter looks more likely: the independent OBR has repeatedly downgraded its forecasts, and Scots assume the oil price stays at $110 per barrel. The economic case for an independent Scotland would be much better if the prediction of a 6.2 percent increase in Scotland’s working-age population in the decade after 2018 comes true. But the Treasury’s base case – actual declines in Scotland’s taxable population over the same period – is more plausible. Although the case from London is stronger, voters comparing the two projections can be excused for confusion. After all, it’s possible that Scotland’s fiscal position will improve, that oil will stay expensive, and that an independent Scotland attracts many migrants. Moreover, much depends on the portion of the UK’s oil revenue and national debt that goes to Scotland, a topic for negotiation after the Sept. 18 referendum. The talks could be bitter. London will be cool on an implication that Edinburgh could refuse to take on its share of the third of all UK sovereign debt held by the Bank of England. It would be surprising if the Scots’ ropey numbers led to a surge in support for independence. But London’s numbers are unlikely to turn voters decisively away. 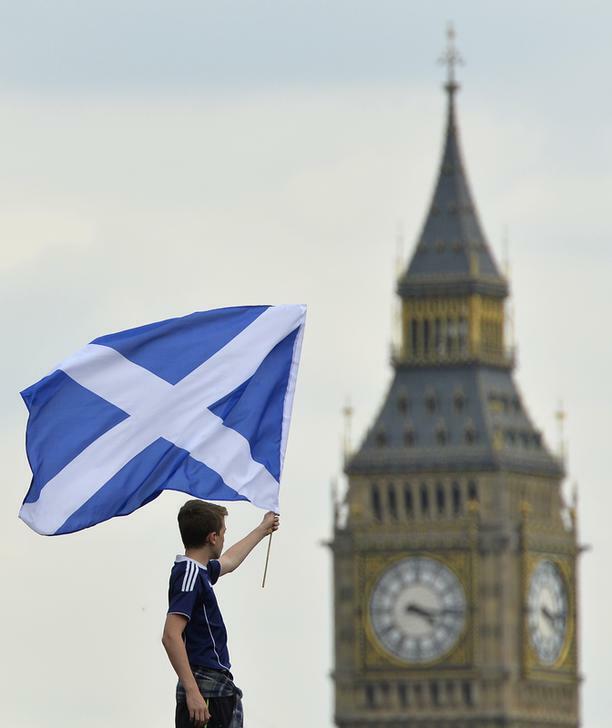 A Scotland soccer fan waves a Scottish saltire flag with Big Ben seen behind in Trafalgar Square in central London. Rejecting Scottish independence would leave Scotland’s citizens 1,400 pounds better off every year over the two decades from 2016/17, the UK Treasury forecast on May 28. The Scottish government, also on May 28, said that each Scottish citizen would be 1,000 pounds richer every year, based on figures suggesting the domestic economy would be 5 billion pounds better off annually by 2029/30. The Scottish government’s figures are based on Scotland increasing its population and closing some of the gap in its employment and productivity rates with top performing countries in the OECD. The Scottish government also assumes that the share of public sector net debt by 2016/17 would lie somewhere between zero and 74 percent of GDP, and oil revenue constitutes 6 billion pounds in 2018/19. The UK Treasury assumes oil and gas revenue of 3.5 billion pounds by the same date and that Scotland takes on a per capita share of national debt, around 74 percent. It also assumes Scotland’s working-age population declines between 2012 and 2025. The Scottish government said that it would negotiate with London over whether to include the 30 percent of gilts owned by the UK government via its quantitative easing scheme in the stock of debt it took on.